With Windows malware getting so much attention nowadays, it's easy to forget that attackers also target other OS platforms. Let's take a look at a recent attempt to install an IRC bot written in Perl by exploiting a vulnerability in PHP. The connection lacked the headers typically present in an HTTP request, which is why the web server's firewall blocked it with the 403 Forbidden HTTP status code error. However, that response was sufficient for the attacker's tool to confirm that it located a web server. "PHP could allow a remote attacker to execute arbitrary code on the system, due to an incomplete fix for an error related to parsing PHP CGI configurations. An attacker could exploit this vulnerability to execute arbitrary code on the system." SpiderLabs documented a similar exploitation attempt in 2013, where they clarified that "one of the key modifications is to specify 'auto_prepend_file=php://input' which will allow the attacker to send PHP code in the request body." This bot was very similar to the one described by James Espinosa in 2013 in an article discussing Perl/ShellBot.B trojan activity, which began with attempts to exploit a phpMyAdmin file inclusion vulnerability. In this laboratory experiment, 'nc -l -p 22' directed Netcat to listen for connections on TCP port 22. 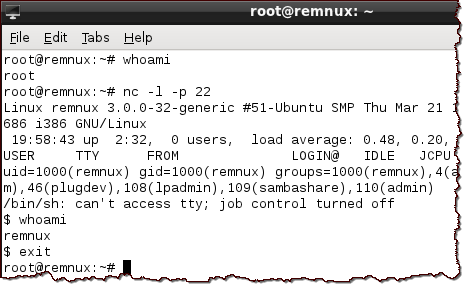 Once the reverse shell script ran on the system that mimicked the compromised server, the simulated attacker had the ability to run commands on that server (e.g., 'whoami'). Interestingly, the production server's logs showed that the system in the wild was listening on TCP port 22; however, it was actually running SSH there, so the reverse shell connection established by the malicious PHP script would have failed. A bit of web searching revealed a script called ap-unlock-v1337.py, reportedly written in 2012 by "noptrix," which was designed to exploit the PHP vulnerability outlined above. That script included the exact exploit code used in this incident and included the code that implemented the PHP-based reverse shell. The attacker probably used that script with the goal of installing the Perl-based IRC bot, ignoring the reverse shell feature of the exploit. The attack, probably implemented using automated script that probed random IP addresses, was designed to build an IRC-based bot network. It targeted Unix systems that ran a version of PHP susceptible to a 2-year-old vulnerability. This recent incident suggests that there are still plenty of unpatched systems left to compromise. The attacker used an off-the-shelf exploit and an unrelated off-the-shelf bot, both of which were readily available on the Internet. The attacker's infrastructure included 3 different IP addresses, none of which were blacklisted at the time of the incident. Lenny Zeltser focuses on safeguarding customers' IT operations at NCR Corp. He also teaches how to analyze malware at SANS Institute. Lenny is active on Twitter and Google+. He also writes a security blog, where he recently described other attacks observed on a web server. Microsoft has updated some bulletins because there are three known issues that can affect your computer. If you have not installed yet those updates, please don't install it until Microsoft pubish a fix. If you already installed it, please check each article for mitigation measures.